lease tell us about your foray into the field of art. How did it all begin for you? My arrival to the art world has been incidental. Growing up, I was very much interested in the arts; whether it was drawing or other creative activities. But I never thought I would become an artist. On the contrary my father, wanted me to become a doctor, or join the army, or pursue a career which would help me secure a position of power like the civil services. Due to my interest in mathematics and physics, I was planning to pursue engineering. Call it fate or destiny, due to series of events and circumstances, I landed in an art college, and the rest is history. Had you always been ambitious and a goal setter from an early age? Which of your goals do you think you’ve achieved? I would say ‘yes’. As an educator, one of my goals has been to play some part in unburdening the new generation of art students from the self-imposed pressure of prescriptive and dogmatic ideas of affiliating one’s identity to political and cultural boundaries. In retrospect, the major shift in my work came when in the late 1990s I decided to deliberately make work borrowing from popular and familiar imagery and visual strategies resulting in works that engaged with wider audience. I would like to believe that I did succeed in the goals I set out to achieve in my art practice. I also wish to explore the idea of art outside ‘art’; I am interested in the notion of ‘Art as a condition of History’ and that it ought to evolve, or how it locates itself in the context of regions such as ours where so many times and eras co-exist. 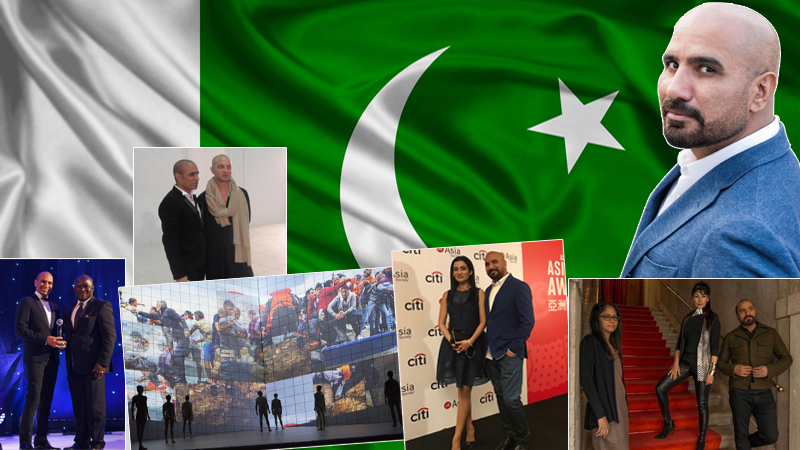 What is your vision for Pakistan and what does it mean to be Pakistani for you? At present Pakistan is extremely polarised, with basically two kinds of forces operational; pro-democracy and anti-democracy, which also includes those educated ones who think that they believe in democracy but at the same time are of the opinion that the masses are foolish and ignorant and that is why their votes are meaningless. I wish for Pakistan to be a place where peoples’ vote is respected and a place where people of all religion are considered equal. As a Pakistani, I believe that being sincere to one’s work is the best way to play a positive role in the larger scheme of things. You have participated in many international exhibitions. Tell us about your most memorable experience. I think, one of the most memorable experiences was showing as the first living artist in a major survey solo show context at the Muse Guimet – one of the finest museums of Asian antiquity. My work took new meaning even for myself because of the context in which they were exhibited. It was an honor for me to have my work installed in various sections of the museum, juxtaposed with master pieces of Asian antiquity. An exhibition entitled Grid <>Matrix, at Kemper Art Museum, St Louis which was held in 2006, with 15 artists from 20th and 21st century including Piet Mondrian, Andy Warhol, Robert Rauschenberg and Agnes Martin was a good feeling to be recognized for a thematic concern which had nothing to do with cultural specificity, often a major lens used by curators. Last year, I was invited to create a ‘set and concept design’ for Multiverse; a dance piece by renowned choreographer Wayne McGregor for Royal Opera House London which was based on legendary musician Steve Reich’s scores. This was also an experience that will stay with me for some time. Working outside the premise of strictly art-making is something I enjoyed and look forward to exploring further. Which has been your personal favourite work of yours so far? Shuhuud-O-Shaahid-O-Mashhuud (The Viewing, the Viewer, and the Viewed, 2015), a multi-site video installation with live camera. This project was part of the 56th Venice Biennale in 2015. When I was invited to participate in the South Asian Pavillion organized by Gujral Foundation, I was very certain that I wanted to do a project which would allow me to explore and posit in the most tangible manner my questions around time, location and identity which I had been exploring in my practice. Venice Biennale being the most visited biennales in the world, I somehow wanted to situate the Biennale beyond its location. I conceived this project to open a portal or channel which virtually bridged the people present in two rooms in mirror-like-setting between Venice and Lahore. Your work must have taken you far and wide throughout the world. Which is your favorite vacation spot? I have enjoyed Paris and Venice as destinations where I have worked and have had vacation at the same time. Maldives is the best destination I have been to for purely vacation purposes. Art requires a lot of concentration. How do you maintain your focus? By keeping myself involved in many tasks at the same time, which is famously called multitasking. For me however this results into being called a workaholic. Somehow it works for me as I never lose my focus. What according to you has been your biggest achievement so far? Coping with fear of flying. Apart from art projects, I have been conceiving a few projects that have stemmed out of the utopian ideas I have been cultivating for some time now. The goal is to now start working on them to translate them into reality. What advice would you give to a novice in your industry? I would like them to believe that their canvas is much bigger than they think. After being involved in the academia for many years, it is my observation that often we compromise on our vision by securing imaginary limitations. Often we have more freedom than we think we do. I don’t quite understand the notion of spare time but if you mean what I am interested in besides art, I like to cook. I enjoy fashion/architecture. I am always building imaginary projects and ideas around/through art, that allows me to push the boundaries of art and its disciplines. Just to give you an example, imagining how art can be done through the medium of other disciplines, even a business. We, at Daily Times, consider you one of our national heroes. Who are some of yours? My national heroes are young men, who choose not to beg, and in fact choose to collect scrap and paper from the dump all day for hard-earned money, which may even be as meagre as Rs 100. I admire people like Asma Jahangir and Jibran Nasir, and all those who are fighting for freedom of speech, democracy and tolerance in this country. Rashid Rana emerged in the early years of this century as the most energetic and productive representative of an entirely new kind of art from Pakistan. He knows his craft like the back of his hand. He is a multi-talented artist and has worked, over the past decade and a half, in dramatically different modes – abstractions on canvas, collaborations with a billboard painter,photographic/video performative works, collages using found material, photo mosaics, photo sculptures and large stainless steel works – each time finding a freshness of purpose, and a surprising inventiveness of visual language. In 2003, Rana won the International Artist of the Year Award at the South Asian Visual Arts Collective (SAVAC), Toronto. That same year, he won the Hathor Prize at the 9th Cairo International Biennale, Cairo. Recently he has been awarded Game Changers Asia Art Award.